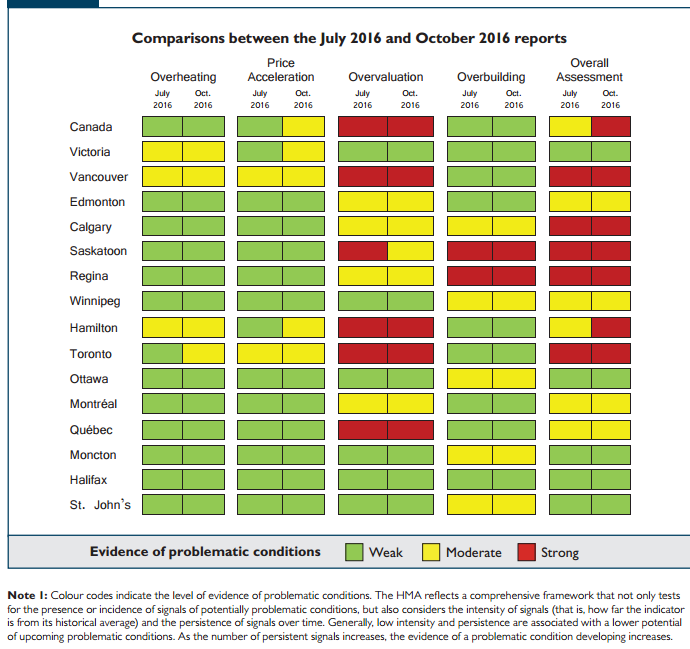 The Canadian Mortgage and Housing Corporation (CMHC) issued its quarterly housing market assessment and outlook today, suggesting that, for the first time ever, there are “problematic conditions” in housing markets at the national level in Canada (see table below for details). As well, CMHC expects national housing starts and MLS sales to decline slightly in 2017 before stabilizing in 2018, which is pretty much the consensus view. What I find strange about the hype surrounding this report is that there is nothing new here. Moreover, the details seem encompass lagged data, before the sales decline and price slowdown in Vancouver–a slowdown that began before the August implementation of a 15% tax on non-resident buyers in Vancouver. The tightening measures announced by the Department of Finance on October 3 are the most recent in a long list of initiatives over the past eight years designed to cool housing markets, particularly in Vancouver and Toronto and surrounding regions. Today’s report is apparently justification for the most recent policy moves, rather than anything new. In other words, the report is looking in the rear view mirror. At least in part, the government has itself to blame for the boom in housing. I am struck by a recent report by Derek Holt at Scotiabank that reminds us of all the measures the government took to spur housing prior to the financial crisis. Most notably–allowing RRSP withdrawals for home purchases in 1992, introducing 40-year amortization periods and 0% downpayments in 2006, the zero downpayment insured investor mortgage (for non-owner-occupied housing purchases) with a high amortized premium in 2007, and offering first-time home buyers tax credits in 2008 and 2009. Clearly, the surge in household debt relative to income was at least in part generated by these politically popular actions, which fueled the already strong demand generated by the decline in interest rates to ever-lower levels. Since October 2008, the government has been scrambling to overturn these measures and more. In a series of steps, maximum amortization periods have been reduced from 40 to 25 years, minimum downpayments increased from 0% to 5%, and stress tests to qualify for a mortgage have been tightened. Refinancing ceilings have also been reduced over time from 95% to 80% loan-to-value and, for buyers of non-owner occupied housing, a 20% minimum downpayment has been imposed. All this happened before the most recent initiatives which tighten mortgage conditions significantly further as well as impose disincentives for foreign purchases. The growth in the demand for housing will no doubt slow in response. What has yet to be tackled is a reduction in government impediments to an increase in the supply of affordable housing that is particularly lacking in Greater Vancouver and Toronto.